The Royal Collection is the embodiment of class and sophistication and the perfect plastic plates for weddings and other formal occasions. They have a block and gold border that gives it a unique look. If you're looking for disposable plates for weddings and don't want to spend the money for real China, then check out this dinnerware. 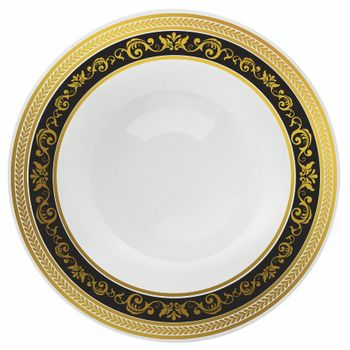 If you want gold plastic plates that look amazing, then look no further than the Royal Collection. They have a classic and clean look that goes great with a large wedding or a small private party. Impress your guests with these plates and enjoy your party without worrying about dishes or broken plates. These plates look great and are durable enough to survive a few tumbles. Available in 10.25", 9", 7.25" plates and soup and dessert bowls.